The Clisby Oil and Gas Division has extensive capability in the wellhead and pipe line installation sector, including working with cultural heritage sensitive environments together with maintaining a focus on Safety and Quality Management to meet specific client, industry and regulatory demands. The Clisby beacons of excellence are in the delivery of a high quality service, always on time at competitive rates being value driven with a lean and innovative approach. Clisby offers turnkey solutions from survey of “right of way” through to pressure testing. No construction project is too small or too big for the versatility of the Clisby project and construction team. Clisby endeavours to be a leader in the Environmental Services sector of the land based oil and gas industry in Australia by providing a multi service environmental consulting and construction service. Clisby has an experienced qualified and focused team who works collaboratively with a large North American company, Matrix to deliver first class results. Remediation and reclamation assessment and construction capabilities. Clisby will provide support or expertise to any challenging or complex environmental issue. The Clisby Blue Hawke Wellhead Filter skids are specifically designed to capture debris, silica, and coal fines during the water extraction phase of CSG wells and will prevent CSG Separators from filling up with fines and reducing design performance. The unique design eliminates pipe erosion from solids and downstream pipeline contamination and blockages. The units are portable with bypass pipe spools, are fully fabricated within a crash frame allowing fast and efficient tie-in with matching flange interconnection, control is electric and pneumatic and Zone 2 compliant. The filtration process is high flow and suits a variety of flows and pressures, the control is PLC and can be interfaced with the client’s separator and well control and is self-cleaning and close to maintenance free. The unique feature of the design is that they are unmanned requiring little intervention. The filter is heavy duty with automatic back wash where the waste sludge is separated from the back wash water leaving a cake for maintenance crews to evacuate and remove. The Clisby Blue Hawke filter is available in a variety of sizes to suit many dewatering or clean up processes, however the Blue Hawke GX has been specifically designed to process the Australian CSG water in all its variables of flows to a specified 50 micron. Clisby is an established engineering company incorporated in 1945 commencing operations in air compressor design and manufacture and has developed into a successful business of manufacturing on and offshore and industrial special purpose equipment in the following applications. Instrument Air: Generally oil free and high quality designed in trains with redundancy and storage, electric and engine driven compliant to full offshore specification. Wellhead Compression: Portable or fixed, self-contained, variable speed and pressure. Desiccant Dryers: Electric or pneumatic control, designed and fabricated for instrument air or pipeline drying. Filtration: Available in threaded or flanged connection, designed and manufactured to suit specific applications to a variety of uses and standards. Nitrogen Generator: Designed and manufactured twin tower or membrane to suit various applications. Clisby Engineering works closely with many upstream gas operators, principally designing and supplying process equipment. Clisby has focused particularly within the significant Australian Coal Seam Gas (CSG) developments where gas transmission from the wellhead is generally a gathering type method relying upon well pressures to sustain the gas flow to the Centralised Compressor Stations (CCS) which thereafter delivers flow under system pressure to large pipeline infrastructure investments for either domestic gas supply or LNG plants for processing and export. It has become very apparent that over time, flows and pressures from wells vary to the point where in some cases, whole of life supply (time and volumetric flow) is interrupted or ceases entirely, simply because the formation pressure has depleted to where it is no longer sufficient to enter the main gathering network. 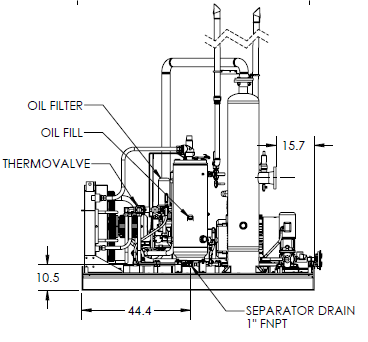 The solution is to introduce a portable infield compressor that can provide variable programmable and intelligent features to extract the reservoir gas value and deliver it into the gathering lines at regulated pressure under a low investment or cost protocol. 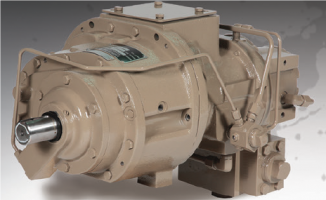 Clisby and Gardner Denver offer two compression technologies, one a Rotary Vane and the other a Rotary Screw. Both designs offer cost flexibility with purchase or rental options available, Clisby provide both options installed within a weather proof crash frame for fast and easy installation as well as ease of transport. All of these factors contribute to meeting the goals of delivering uninterrupted energy efficient pulse free gas to our customer’s gathering systems. The Clisby GD units are intelligent and self diagnostic, this allows them to sense inlet and outlet gas pressures and automatically adjust compression rates according to predetermined parameters. The units are equipped with remote monitoring and with low noise emissions, do not contribute to noise pollution. The inlet gas flow contains a liquid knock-out and filtration system to protect the compression hardware using a 5 micron gas filter and cyclonic separator designed and fabricated in SS316. The post compression stage will incorporate a specially designed aftercooler to maintain a discharge temperature at levels within the parameters set by the client and the flow line manufactures’ and installers’ specifications. The units include considerable operational and safety features such as telemetry for off-site monitoring. Additionally they can be set up with SCADA or similar systems upon request that will monitor pressure and temperature at all stages of the process and of course incorporate an emergency shutdown system with a bypass system to ensure safe operation in an unmanned application.